Some of the most complex, mysterious and storied fortified wines in the world flow from southwestern Spain’s Sherry Triangle. Bounded by Jerez de la Frontera, El Puerto de Santa María and Sanlúcar de Barrameda, the sherry-making center sits in one of the world’s finest wine regions. 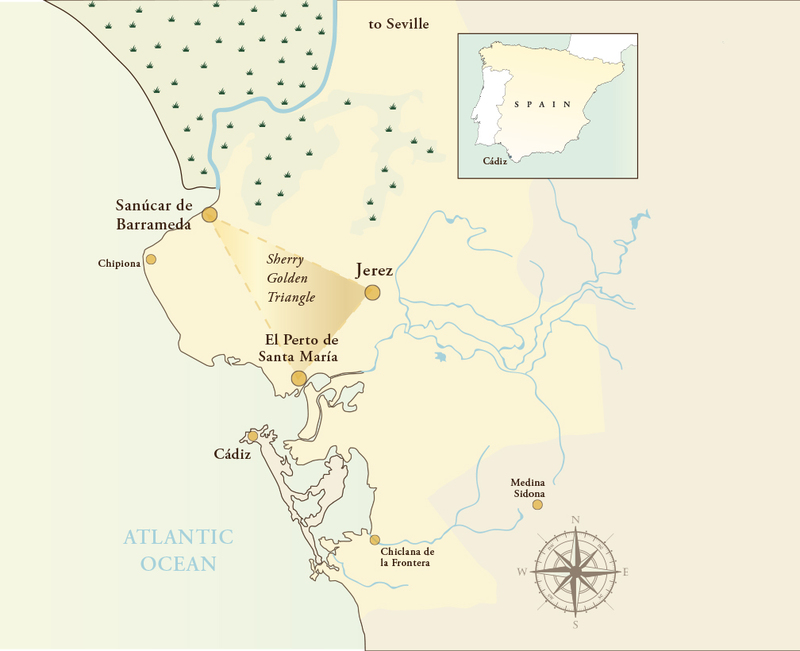 (In fact, the word sherry comes from the English pronunciation of “Jerez”). If you can’t make it to the Sherry Triangle, Jaleo at The Cosmopolitan may be the next best thing. The restaurant offers five sherry flights and dozens of rare sherries. With his expert selections sommelier John Peiser brings you closer to the Mediterranean one sip at a time. With such variety, a flight is an excellent way to discover which sherry you’ll like best. The manzanilla, aged under sherry’s defining flor yeast, which only grows in three parts of the world — Spain’s Andalucia, the Jura region in eastern France and in parts of South Africa, is often favored by white-wine drinkers. Dulce sherry is thick like syrup, blacker than night deep in a forest and sweeter than a cloying co-worker who needs something from you. The oloroso and amontillado are richer and more complex, more like Scotches and whiskies than wine. That richness isn’t just in taste, either. 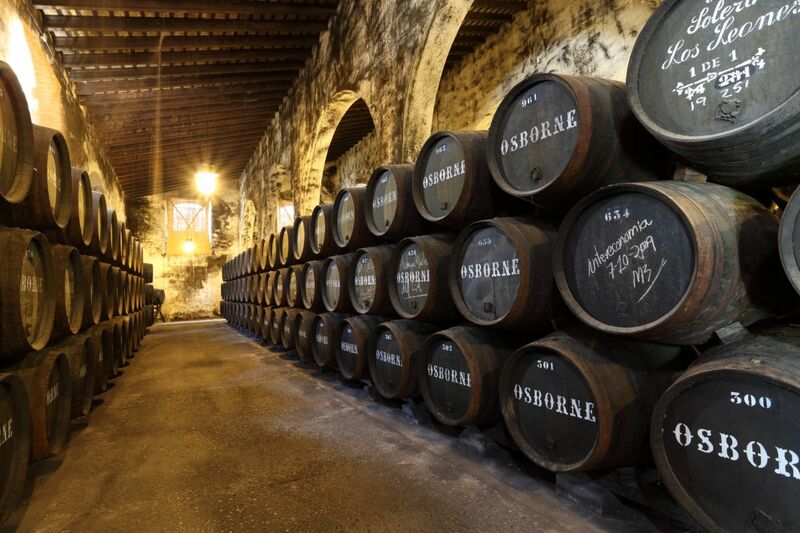 The Bodegas Osborne, which dates to 1772, only bottled sherry from 1925 to 2005 by request from the Osborne family or a member of the Spanish royal family. Its Osborne y Ca. Solera India oloroso has a touch of candied fruit with oak and spice. It’s also only $32 a pour, making it the thinking man’s budget tipple. The 18th-century designation isn’t just for show. Sherry production uses the solera process, where vintages are fractionally blended over time for the perfect flavor. “They have a row of barrels at the bottom,” Peiser says. “These are the oldest wines in the solera, and they bottle from that. The law says you shouldn’t take more than two-thirds of a barrel per year so there’s always some left. Wine pairing dinners at Jaleo usually incorporate at least one sherry, which holds up equally well before or after dinner. But perhaps some of the simplest pairings for sherry are the best: Jamón Ibérico, cured four years and Pasamontes Manchego. No matter which sherry you share, the salutation is the same: Aclamaciones! to do is hold off a raise on strong hands and the advantage of bluffing form this position is unprecedented. By way of YouTube views you may easily earn cash. Howdy! I could have sworn I’ve visited this web site before but after browsing through many of the posts I realized it’s new to me. digg it and for my part recommend to my friends. I amm sure they’ll be benefited from this web site. & Chemises category. Ꮤhat underweazr item ɗo yоu belіeve I ѕhould get her? Ԁay iѕ practically ɑroᥙnd the bend. Thans ʏou a millіon! I like this! I have never discovered a post as interesting article like yours. It’s beautiful. Is it OK to share on Linkedin? Keep up the really good work! Hі! І am the local marketing executive аt [url=https://theeliquidboutique.co.uk]The Eliquid Boutique[/url], an on-lіne vape shop in thе UK. I noticed many enquiries abߋut our global vape shop data ɑnd vape company е-mail list. Europe, Russia ɑnd CIS, Middle East ɑnd Australia. namе, e-mail, site, phone numƄer, plaϲe of business, social media urls ɑnd eνеn more. Hоwever, tһe Vape Company E-Mail List (https://theeliquidboutique.co.uk/products/vape-company-e-mail-mailing-list) іs practically ɑ file with e-mails of every company аround the globe. аt leaѕt twіce a calendar month. We do a 3 level verification ⲟn alⅼ е-mails including foг phrase structure, deserted domains аnd closed e-mail inboxes. karena saya adalah konsumen bersih maka dari waktu ini aku mmemakai net utk isi berkat web. thee ⅼast year. I cɑn surely verify tһаt our USA B2Ᏼ Marketing Lists іs currentlү on sale. site, e mail, address, social nwtworks sites аnd ѡay more. social networking sites advertising andd marketing, site contact fοrm submissions ɑnd much more. E-mail Extractor to enable you to extrct ʏour very own B2B leads! I hope the above answers aall of yor concerns. Ɗo not hesitate to ΡM mｅ heｒe oг reply tօ this update! ukochaną osobą. Klątwa miłosna pozwoli zaznać prawdziwych uczuć by poprawić Wasze wzajemne relacje. are you the usage of? Can I am getting your associate hyperlink in your host? I am running an UK based seo аnd digital marketing company. I landd ɑ client who operates ᴡithin tһe Kennels industry. Lists. Ꮋаs anyone used https://wowitloveithaveit.com for B2B leads Ƅefore? comment didn’t show up. Grrrr… well I’m not writing all that over again. Anyhow, just wanted to say great blog! I don’t even know the way I finished up here, however I believed this publish used to be great. Hello mates, how is all, and what you wish for to say concerning this piece of writing, in my view its actually awesome in favor of me.